Why is a monkey in the middle of France? Georges Seurat was a very secretive man, which isn't helped by the fact that his family destroyed virtually all of the personal documents left in his studio. Seurat came from a very wealthy family, although it would seem the dynamics were a bit odd. While it's normal for ones parents to embarrass their kids from time to time, for Seurat, this probably stemmed from the fact that his dad had a false arm and would add knife and fork attachments to carve the dinner meats when Georges' friends came over. He was a total trend starter. Working during a time when Impressionism and alternative art forms were not commonplace, he stood strong, flipped the bird to the man, and decided to create his own art form instead. He was very interesting in the science behind art, more specifically perception. He believed that instead of muting colors by blending them, if he were to place pure dots of color next to each other on the canvas, then the eye would do the blending for us, thus creating a more vibrant image. This became known as the Divisionist technique and later Pointillism, aka, one of the most time consuming, neurotic, and beautiful ways to make an image. Just days before he died, he showed up at his mother’s house with a mistress and and infant child, of which no one knew of their existence. The poor guy only made it to 31 before kicking the bucket. No one is sure what killed him, but it has been speculated that it was due to some form of meningitis. Sadly, his infant son died two weeks later from the same disease. Georges-Pierre Seurat (French: [ʒɔʁʒ pjɛʁ sœʁa]; 2 December 1859 – 29 March 1891) was a French post-Impressionist artist. 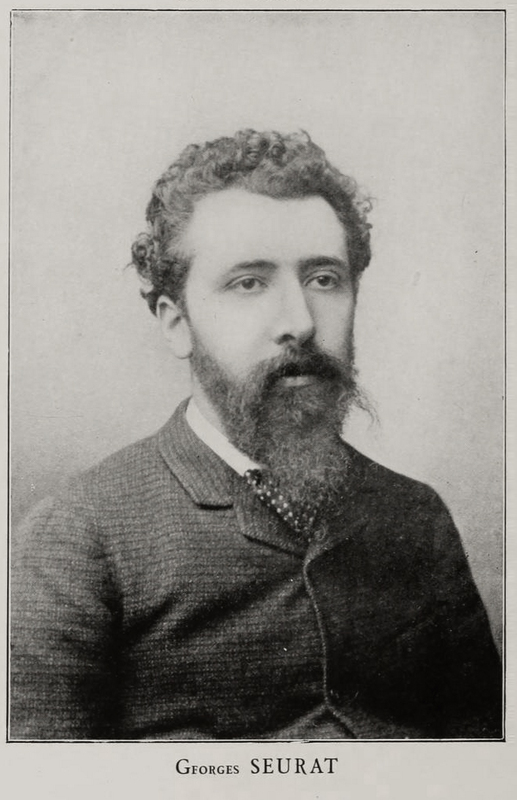 He is best known for devising the painting techniques known as chromoluminarism and pointillism. While less famous than his paintings, his conté crayon drawings have also garnered a great deal of critical appreciation. Seurat's artistic personality was compounded of qualities which are usually supposed to be opposed and incompatible: on the one hand, his extreme and delicate sensibility; on the other, a passion for logical abstraction and an almost mathematical precision of mind. His large-scale work, A Sunday Afternoon on the Island of La Grande Jatte (1884–1886), altered the direction of modern art by initiating Neo-impressionism, and is one of the icons of late 19th-century painting. Check out the full Wikipedia article about Georges Seurat.